Andy, how did the magazine start? The first issue came out in March 1986. Myself and Mike Ticher [WSC co-founder and first editor] used to work in a record shop, and Mike had done a music ‘zine when there were quite a few of those around in that big fanzine culture. We used to talk a lot about football and he thought there was maybe a way of doing a football spin-off of this music ‘zine. We did the first issue which was just photocopied, and we sent one to the Guardian who gave it a mention in the Saturday diary. We got about 200 letters the following week, so without really intending to we tapped into a potential audience there. Really the idea from the start was to provide – and initially only in a small way – an opportunity for people to express their views about football. Football fans at the time had a very bad image, post-Heysel, and the general perception in the media among non-football fans was that we were all hooligans, so we thought this was something that needed to be addressed. The idea was to be funny as well as serious, and to address different aspects of fan culture. Did you think you had to defend football fans? It was partly a feeling that, because at the time the fans were the main ‘sponsors’ of football – which they aren’t now – their opinions weren’t really being taken into account by people who ran the game, either by the clubs or the football authorities. As we knew already by Heysel and as Hillsborough showed a few years later, stadiums were in a very bad state of repair, and there were loads of issues to do with policing, and a general sense that fans were being taken for granted. They had been part of popular culture for over 100 years but it wasn’t really being recognised. With football being so ubiquitous now, how has your approach changed in relation to that? Football obviously has a much more elevated position now, but sort of in the ‘wrong’ way, in that it’s become a commodity, and part of global corporate culture. That only reflects broader economic trends – football clubs are owned by hedge funds and oligarchs, as is most of London, so it’s just born out of the trends in the global economy. We feel in a way that in the 1980s our voice was not necessarily in the margins, but we existed alongside the mainstream. 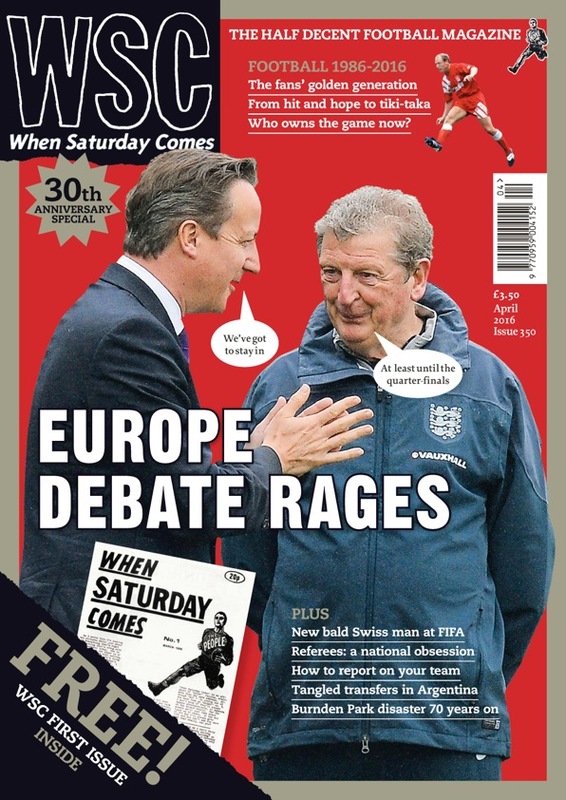 Initially we were saying that football was important – not in a pompous way – and should be recognised as an important cultural ‘thing’, whereas now we’re saying a lot of the hype around football is overblown, and that while there are lots of ways the game has changed for the better, some of the more recent developments have not been good. I think the key thing is that we can’t be seen to be complaining all the time – if you were interested in cars you wouldn’t buy a magazine by people who said they hated cars. We have to…I wouldn’t say ‘rein ourselves in’, but we have to be conscious that we can’t be negative or finding fault [with the modern game] in every issue. 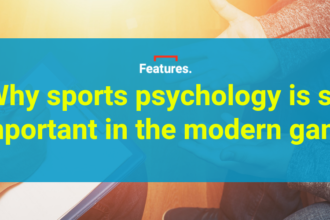 We do have to always try to strike a balance in different ways – in terms of the different levels of football we write about, covering the top level and lower leagues, covering football overseas as well as here, and having some funny stuff to go along with the more serious stuff. 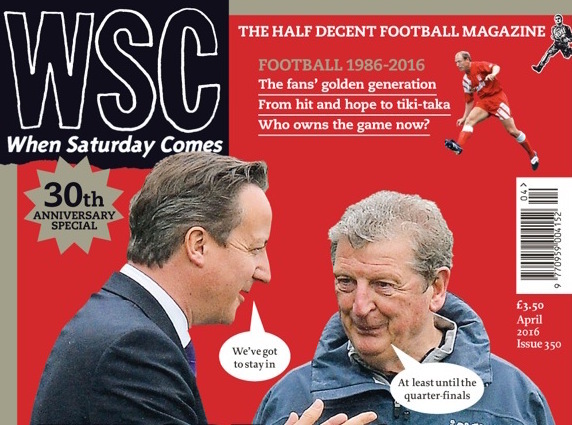 We’ve developed a niche at one end of the market, so we accept that for a lot of people who go to games nowadays, WSC isn’t necessarily the magazine for them, and they don’t necessarily ‘get it’. And that’s OK – we’ve managed to retain an audience of people who do get where we’re coming from, and despite having a lot of different writers there’s a broad, consistent outlook that we’ve had over the magazine’s lifetime. There always seems to be a few new names of contributors in every edition – is that a conscious thing to keep things ‘fresh’, or is that just how it has evolved? I think it’s just how it’s evolved. I think it’s probably the case that pretty much since the first issue we’ve had at least one new contributor every month. It depends on what subjects we’re trying to cover – obviously over the years we’ve built up a network of people around the country, and abroad as well, but often a subject comes up or something in an area of the world we don’t know anybody. Obviously now it’s easier to find contributors just by looking on the internet, social media etc, so we do have a steady supply of new writers, and people do contact us as well with ideas for articles. There’s always been a mixture of people who you’d say were professional writers and others who are supporters and are interested in writing. Something like WSC, before the internet came along, was one of the few places that someone who perhaps wasn’t a professional journalist could write, or get their voice heard, but now someone like that would just start a blog in five minutes. Has that sort of thing had any impact? It’s certainly affected the amount of unsolicited contributions we get. We don’t get nearly as many people offering us articles as we once did, because they obviously have blogs or other websites. And also over the years there have been a number of topics we’ve covered quite a lot, so we’re conscious of not going over old ground, although inevitably we do repeat ourselves occasionally. Early on there were certain types of ‘funny’ stuff that I suppose was pretty much done in the 1990s, through football fan culture and things like Fantasy Football, so we tend not to be quite so interested in articles about ‘funny fat players’ or whatever. We’d always be interested in someone coming at something from a new angle, but there are those sort of, what I’d call ‘fanzine’ subjects, that we don’t cover so much anymore. Yeah, the average age of readers early on was the age we were – early 20s, broadly post-college age – but mostly the readership has got older as we have. We obviously do still pick up new, younger readers and we’re aware we need to keep appealing to those people, but without consciously tailoring the content of the magazine. We don’t just want to be writing about a set period of time, covering when we were teenagers or in our 20s, because that wouldn’t necessarily mean much to younger people, but I tend to think that we’ve succeeded if an 18-year-old Manchester United fan wants to read the magazine, if there’s something in it for them. Definitely. Some of the newer contributors we’ve picked up will be of the ‘social media generation’, who are at least on Twitter and in some cases people we’ve found there. And to some extent we do look for new people – say if we want a different Arsenal fan so we’re not asking the same contributors all the time. We always want to have a few different people, plus we’re also conscious that while we do pay writers, we don’t pay a lot, so I don’t want to be asking people to do a lot of work when we aren’t able to pay them a great deal. One of the things that must be tricky running a monthly magazine is that if someone has an idea, elements of it might be out of date by the time it’s published. Is that a problem, and if so how do you deal with that? To an extent. 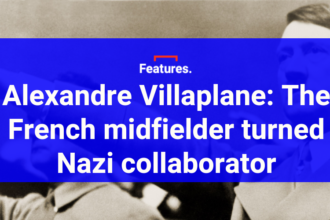 We always sort of assume that the readers follow football and the news on a day-to-day basis, so we’re always wary of thinking of an angle that hasn’t already been covered. These days I don’t particularly worry if a subject has already been covered, but there are a number of things that we do need to cover – things like the FIFA presidency, or when the Hillsborough jury comes back, even though we know existing news media will have already covered it. Broadly speaking I don’t really worry about that sort of thing now, although obviously there are subjects that we know we won’t be giving the reader new information as such, but more that we’ll be commenting on it. What do you think it is about the magazine that has secured its longevity? I think we were able to build up an audience [early on]. Ironically I think that if we were a professional enterprise right from the start, we would only have lasted a couple of years. If we had sales figures to achieve or advertisers to find, it wouldn’t have been able to grow organically as it did. The fact that it wasn’t professional [initially] and developed fairly slowly – it only went monthly after about 13 or 14 issues – was a factor, and around half our readership are subscribers. The people who have been reading it for a long time are the foundation of the magazine’s survival, the people who identify with our take on the subjects. You quite famously ignore MK Dons, particularly in your pre-season previews (WSC leaves a blank space where the section on MK Dons would be) – given that they’ve been around for a while now, and they have lots of new, young fans who might not be aware of the history, can you see your stance changing? What’s been your particular highlight of the last 30 years? Personally my highlights have related to John Peel. Somebody wrote in after our third issue with a cassette tape of his show – this was around 1986 – when he had read out a few lines from the new issue, which was our post-World Cup issue. And then more recently somebody sent us a link to a sound file of his show from 1992, on the day the launch of the Premier League was announced. There was a news bulletin in the middle of his show, and on that they had a quote from Graham Kelly and a comment from me – I don’t remember doing this, by the way – saying I thought this would be a bad thing for football. It cut back to John Peel and he mentioned that he’d got the new issue of WSC that day and was going to read it on the train home. That sort of stuff [I liked], and finding out other people I admired were readers too. But just in general, I think the fact that we’ve been able to survive without ever particularly chasing the readership. We haven’t consciously thought at any point that we need to shape the magazine around what the readership might be interested in – we’ve always taken the view of the old-school BBC idea, that we would tell people what we think they should be interested in, like a sort of benign authoritarianism. Hopefully we’ve trusted our own judgement and – while I’m sure we could’ve done some things better – it’s broadly turned out to be right.